Does the best toaster oven for baking exist? Wide range of temperature (150-450 degrees F) and convection technology. Convection technology will help to bake various dishes more evenly and faster. With IQ technology on board, oven can adjust the power to the needed level, and memorize your preferences. State-of-the-art electronic touchpad controls, a stainless steel bar handle and side grips. Double Infrared Light technology is more powerful than convection one can save you up to 40% of the time. If you like an amazing home-cooked bakery, there is nothing more efficient than the best toaster oven for baking. They allow creating sophisticated masterpiece dessert without efforts. Air circulation technology reduces the time on baking by 25%. We’ve revised 5 models that are also functionally versatile and both amazing for baking and other types of cooking. The best option as to price and performance is Breville BOV800XL. Who do not like sweets, especially homemade cakes and casseroles? There is hardly anyone who is indifferent to this type of cooking. But, unfortunately, it takes much time to bake delicious dishes in a traditional oven. What should you do then? With the appearance of such kitchen appliance as convection toaster oven, you can reduce up to 25% of the time for cooking. How can that happen? This is due to the convection technology, in other words, a hot air continuous circulation that helps to prepare your food faster and more evenly. What is more, a toaster oven is a combination of a pop-up toaster and a traditional oven; thus, you will be able to not only toast or bake your food, but also broil, roast and even warm it. 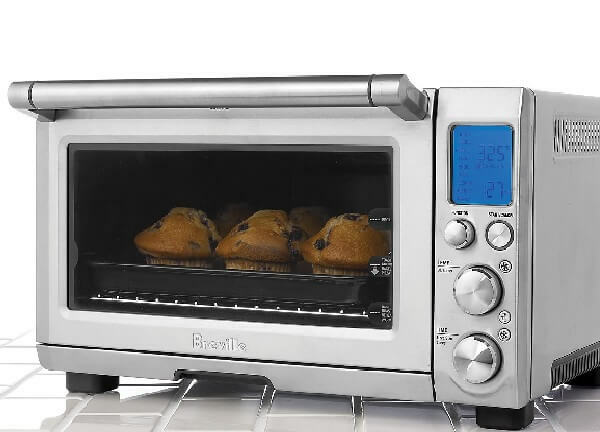 By reading our expert reviews of the most famous models, you will find out what is the best toaster oven for baking and what should an ideal model feature. When considering best-rated toaster oven, you should always keep in mind some crucial factors that determine its functionality. Is this model versatile or it can only bake? A modern convection toaster oven is multifunctional, thus it can replace most of your kitchen gadgets. How well is it made? Consider only models that are made of stainless steel to avoid its melting when working under the high temperature. Is its price equal to quality? Cheap price doesn’t always mean poor quality, and to find out about your definite model, always do online research and read other buyers’ comments. This is a powerful kitchen appliance that can fit six slices of toasts or 12-inches pizza. Besides, with its wide range of temperature (150-450 degrees F) and convection technology, this kitchen helper will become your best friend in baking. Using it, you can reduce the time of cooking up to 25% and prepare crispy and even-browned dishes with ease. Its two rack positions and a large interior with light will help to cook a meal of different sizes and the 90-minute timer will tell you when your cake or other yumminess is ready. Besides, an adjustable broil can let you broil at any temperature, thus you can create whatever dishes you want and this process will be much faster and productive. What is more, all its components are easy-to-clean, thus you will not need to spend hours cleaning your device after cooking. If you fancy baking, you may take advantage of two modes installed: baking and convection baking. Overall, it is a real discovery for housewives who need cooking various dishes daily. Some buyers complain about it becomes too hot on the exterior while working. An updated version of Black&Decker brand, this 6-Slice Digital Convection Countertop Toaster Oven features easy-to-use digital buttons that will help you to select time, temperature and various cooking modes and 120-minute timer. It is spacious enough to cook 6 slices of bread or 12-inches pizza due to the large interior and three rack positions. And, like all the modern toaster ovens, it has convection technology, thus the hot air circulated in the oven, will help to bake various dishes more evenly and faster. Besides, this model features wide easy-view glass door that can let you see your food during cooking. You can optimize your at-home cooking by buying this model of toast oven, which will not only toast your bread, but also help with preparing numerous dishes. Words from controls are easy-to-wear-off. This is a powerful device that features 1800 W and five quartz heating elements. Besides, with IQ technology on board, it can adjust the power to the needed level, and memorize your preferences. With its backlit LCD display, you can easily see the selected coking mode, temperature and other important parameters. What is more, it is highlighted in red when your food is cooking and blue – once it’s done. Breville BOV800XL Smart Oven is a smart device with nine cooking regimes, which means you can not only bake your food, but also bagel, roast, broil, toast, prepare pizza reheat or warm it. This model could be a great variant for people who enjoy buying last models of new helpful gadgets, as it is stuffed with numerous functions and technologies. For some people this device can be too smart. If you are searching for a new kitchen helper, which can assist you not only with baking, but has plenty of other useful features, you should consider buying this device. Like previous devices we have reviewed, this quite compact in size, but powerful device, fits 6 toasts simultaneously. Its Shade Control feature, with the help of installed heat sensors will assist to maintain the needed temperature, and with convection technology, this is a double win! What is more, this multifunctional model with various cooking modes installed has digital touchpad controls and timer, which will beep once your meal is ready. 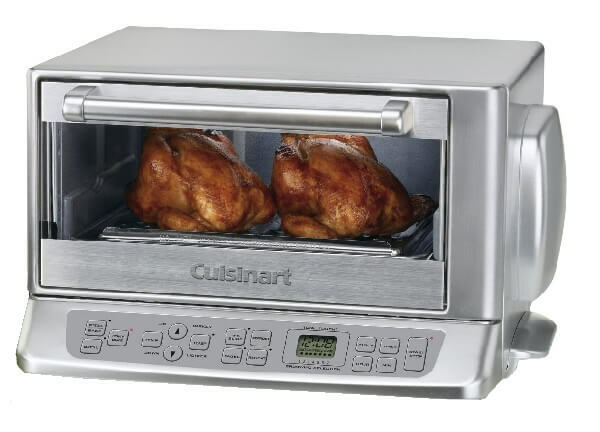 If you want to forget about daily kitchen routine, Cuisinart TOB-195 Exact Heat Toaster Oven Broiler might really assist you with this hard task. Multifunctional device with numerous cooking modes. Its design may not be your cup of tea. The last model we are going to review is created by a world-famous Panasonic brand. PAN-NB-G110PW Flash Xpress Toaster Oven is really fast, with its double Infrared Light technology that is even more powerful than convection one, it can save you up to 40% of the time. And, what is even more important, you will never preheat your food using this device. Besides, it has different cooking regimes from those models we have reviewed: Waffle, Quick, Pizza, Roll, Toast and Hash Brown. These cooking modes choose the necessary temperature and time automatically, which guarantees even cooking. This smart kitchen appliance features stay-cool control panel, where all the important control and buttons are located. If you need a compact but smart solution for your cooking Panasonic PAN-NB-G110PW Flash Xpress Toaster Oven will be a perfect match for you in this case. We have made best toaster oven for baking reviews, and considered five most popular models of toast ovens on the market. We can say that they all are great appliances that can change the way you cook drastically. However, some of them have some additional features. 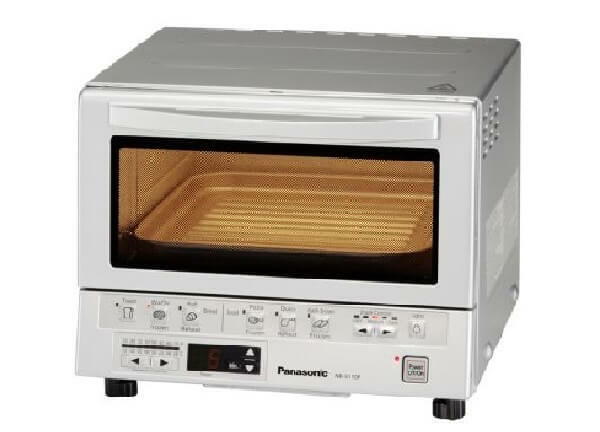 For example, if you are searching for ways of how to speed up the cooking process, consider Panasonic PAN-NB-G110PW Flash Xpress Toaster Oven because of its double Infrared Light technology that can save you more time than a convection oven. 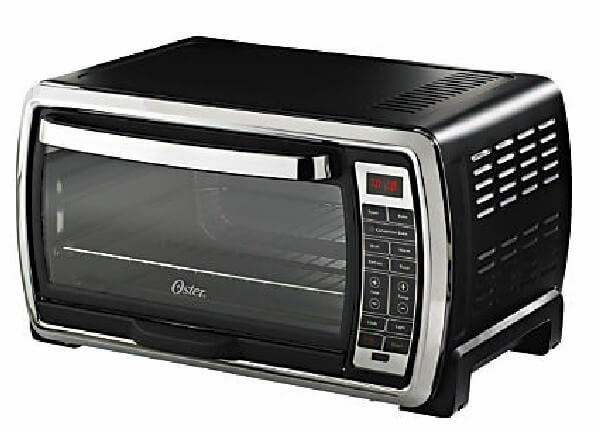 If you are looking for a large device that can cook many portions at once, then consider buying Oster Large Digital Countertop Convection Toaster Oven or Breville BOV800XL Smart Oven 1800-Watt Convection Toaster Oven with Element IQ. 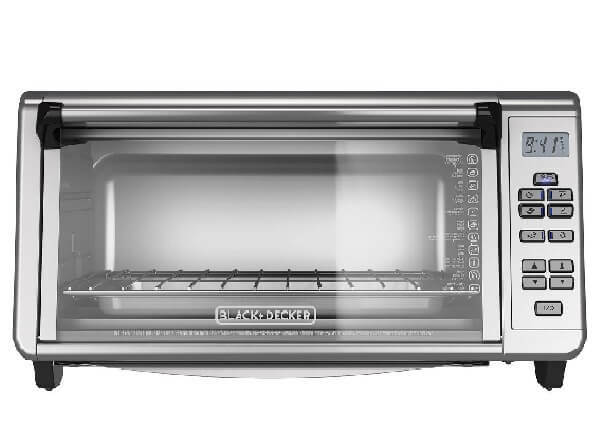 And if you prefer digital models, have a glance at BLACK+DECKER 6-Slice Digital Convection Countertop Toaster Oven. We really hope that our expert opinion on the best toaster ovens that can help you with baking might be helpful for you once you decide to buy a new kitchen helper.